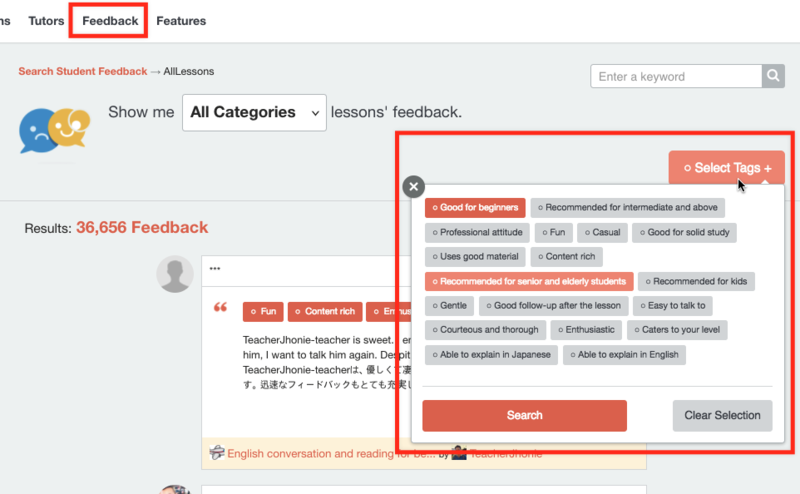 There are many ways to search for lessons on Cafetalk, for example: by category, by tutor, by keyword, etc. 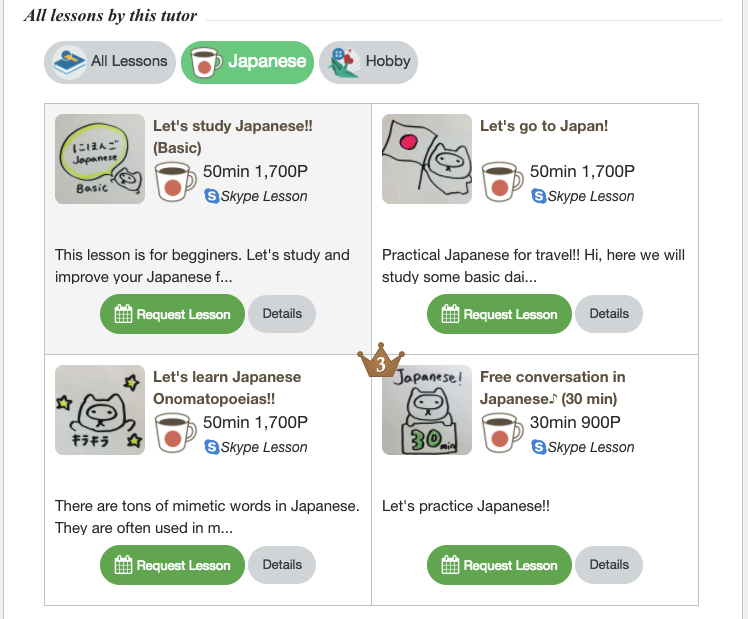 Go to Cafetalk’s homepage and hover your mouse over “Lessons” on the top menu. A drop down menu will appear, showing you categories such as “Language,” “Music,” and “Art.” Select the category that interests you. 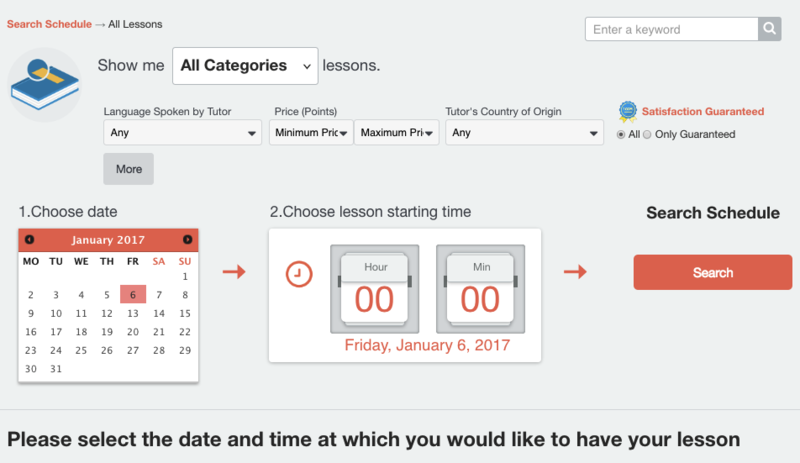 The lesson search page has some additional options you can set to narrow down your choices. Free word search: you can search for lessons by typing in what you’re looking for (ex. TOEIC, JLPT, interview). Language spoken by tutor: you can search for tutors based on the languages they can speak. For example, if you’re looking for a tutor who teaches Japanese in English, select Language/Japanese, then select “English” as the language spoken by tutor. More: additional search options include qualifications, tutor’s country of residence, has trial, has material. Searching tutors is a great way to find lessons that best meet your needs. 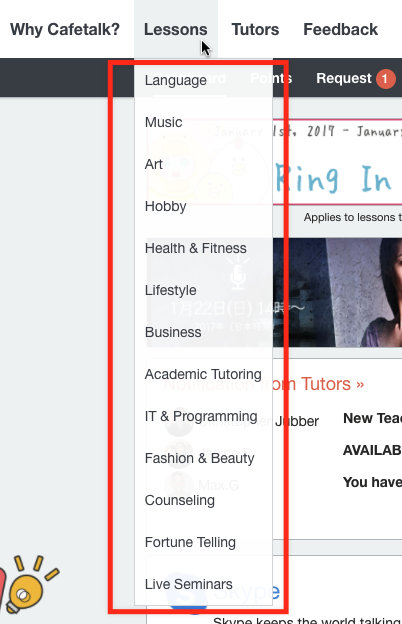 Click on “Tutors” on the homepage top menu and click on a tutor that you’re interested in. This will open up their profile page and let you take a look at the lessons they offer. 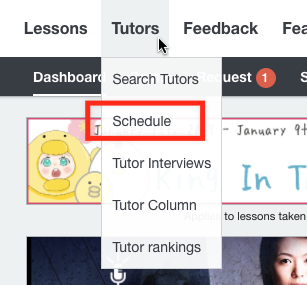 If you hover your cursor over "Tutors" and select "Schedule," you can search for lessons based on your desired lesson time. If you’d like to refer to reviews that other students have written before commiting to a lesson, you can do so from the student feedback page. This page allows you to choose the category you’d like to read reviews for, so it can be helpful if you’re trying to choose between different lessons. In addition to searching reviews by category, you can also search by tag. Click on the “Select Tags” button and select the tags that describe what you’re looking for.